In this course, we learned methods to solve real world problems with simulations in MATLAB. Each project compounded on top of the next in terms of difficulty (increasing our knowledge of differential equations) and complexity (adding multiple variables). These were all a series of 2-person team projects. Project 1: Populations: How Many Students Can Olin Admit? Students could pick anything that had to do with populations. I chose to work on the challenge of student admissions. My teammate and I found that the ideal number of students was 84 if Olin wanted to have a sustainable student population in 100 years. Additionally we found that if Olin admitted the same number of students as those who were graduating, only exchange students would be left. Project 2: First Order Differential Equations: Pharmacokinetics-- How long do you have to save someone from a heroin overdose? Using some basic parameters we discovered you don't need to be too precise to come to a basic conclusion about how medication reacts in the body. My team chose to work on modeling the absorption of heroin in an average-sized body to experiment with the various time frames and dosages required for a person to survive the typical dose of Heroin using a drug known as Naloxone, that helps to unblock the mu-opioid receptors. The mu-opioid receptors, once blocked, cause humans to die from an overdose. Our model proved that as long as we could get to the overdosed patient within an hour, they would survive with a typical dose of Naloxone, but any point after two hours, mortality rate is about 99%, which correlates with many papers written on the subject. Project 3: Second Order Differential Equations: Projectiles in Space--Using a gravity slingshot, how long would it take to leave the solar system? Today's technology limits us to only being able to send a probe into space with enough fuel to only reach the limits of Jupiter. In order to go farther, the probe needs to capture some energy from nearby larger masses, such as Venus or Jupiter, to give it enough energy to reach the edges of the solar system. My project was based on the successful mission of the Voyager probes and the goal was to see how long it would take for a probe to reach interstellar space, or in our case, since no one has actually reached interstellar space, the edge of our solar system known as the heliosphere. Our model estimated that it would take approximately between 28-37 years, validating the timetable for NASA's Voyager I mission that, after 33 years, just recently reached the heliosphere. 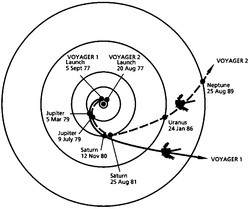 Voyager I was launched in 1977 and is expected to cross the boundary within the next few years.